How Much Money You Can Make From YouTube Videos? YouTube Vs Vimeo: Which one is best for video makers? Are you decided to create videos for YouTube Platform? Well, that is a great option for filmmakers and video creators to generate income from their videos. At present, the YouTube is having 1 billion users’ presence and 300 hours of videos, upload to YouTube on Every Hour. Check out the YouTube Statics here. ‘YouTube Ads, Sponsor Advertising and Affiliate Advertising’ are the three ways that you can earn money from your YouTube Channel. Among those three, the ‘YouTube Ads’ is the major source for generating Income from your videos. A recent article of New York Times about the Olga Kay’s (a leading YouTube video creator) revenue from her YouTube Channel is around $100,000 – $130,000 per year ($8.3k – 10.8k per month). Another Video creator, Mimi Ikonn’s approximate monthly revenue from YouTube is around $20,976.00 – $44,160.00. 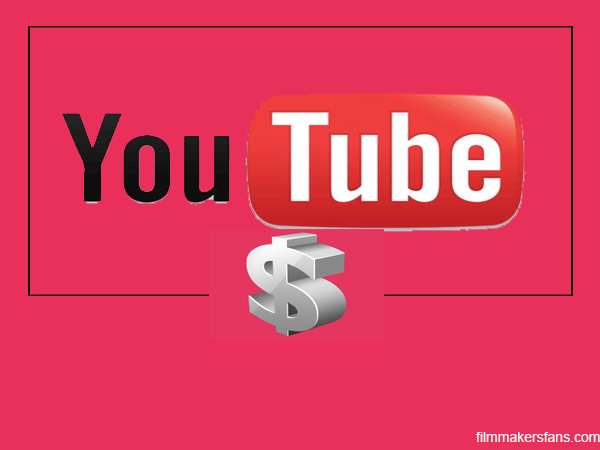 You can earn money from YouTube Videos through the below explained three ways. YouTube Ads partnership is the real source for earning money from videos. BUT, they will display advertisements on your YouTube videos, only after an approval from both sides. Two things are mandatory for this approval: The first needed thing is, you must verify your YouTube channel and the second thing is your YouTube channel must have a video with 5000 views. Now, if you are qualified in both the above sections, apply now for YouTube Partnership. Usually, their review for new account partnerships will take around 1-2 weeks. If approved, they will request you to connect your bank account with YouTube Ads programme for sending money on a monthly basis. Usually, you notice Non-skippable ads in YouTube Channel. Yes, these ads are appearing only because of content creator’s interest (Not YouTube). Non-skippable ads are approximately 15 or 20 seconds in length and the ads are sold on a CPM (Cost Per Thousand), means YouTube will pay you $3-$7 for 1000 views. As the name implies, ‘Skip Ad’ option allows the viewers to skip the ads after 30 seconds. 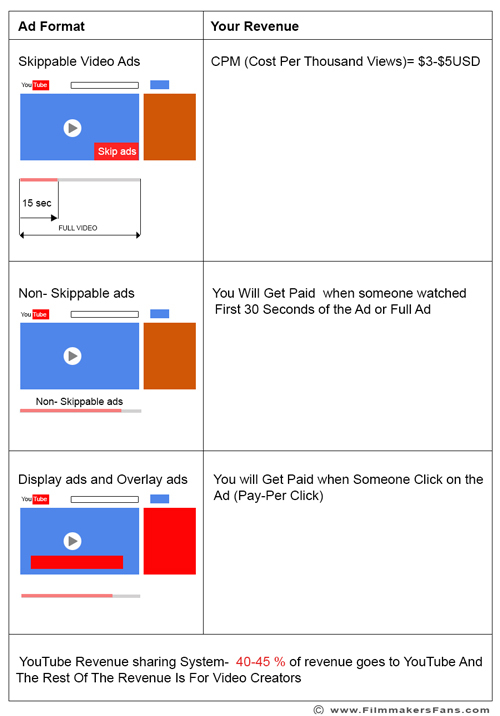 The advertisers will pay, only if viewers watch the first thirty seconds ad (or) full ad. In this, case we can’t predict how much you can exactly earn from YouTube-Skippable ads. But, you can get an idea from Socialblade’s YouTube Money calculator Tool. In the ‘In stream Ads’ there is no Skip-Ad option. In case, your viewer is not interested in Ads and found no-skippable ads option in your YouTube Video, then he will either close that page or Unsubscribe from your YouTube Channel, if that happens then it would be a loss to you. The ad that is appears above the video control section is ‘In-Video/Overlay ads’. Advertiser will pay you, when someone click on that link. The ad that is appears on the top right side bar of the featured video page is called display ads. As like ‘InVideo’ You will get paid, if someone click on that link. YouTube will take 40-43% of the revenue from advertisers and they will share the rest of the amount to the content creators. 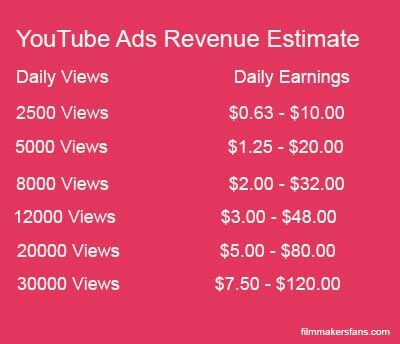 See the Image Below, this is approximate ads income that you can earn from YouTube Videos. If you are a popular YouTuber, you can easily find Sponsors for making YouTube Videos. There are plenty of filmmakers, now a days adopting this ‘Sponsor Advertising’ method of video creation. Ryan Connolly of YouTube Channel –FilmRiot is creating videos mainly through Sponsor Advertisement. If you are creating videos with the financial aid of someone’s ‘Sponsor Advertisement,’ then it’s your responsibility to promote your sponsor’s brand through your YouTube Videos. But keep in Mind this thing; don’t ever force your viewers for watching your sponsor’s videos. Just follow a neutral way of storytelling, that’s it! This method is not exactly useful for filmmakers to earn money through YouTube Videos; also you can expect a less amount through the affiliate marketing programme. Let’s explain about the affiliate marketing very simply; For an instance, you displayed a product of ‘Amazon’ in your YouTube Video, here you will get paid only when someone buys that product, and the amount sum is very less (Probably 1-2% of the product cost). So, we think this (Affiliate Marketing) is not a right option to make money from YouTube Videos. HOW TO MAKE MORE MONEY From YouTube? I’ve had 14.430 views the last 28 days. Why did I only make $ 0,91 from these? If your video has 14.430 views then you can earn $123.75 – $1,980.00. However, we want to ask you that is your content copyrighted to you? Hello , I want to know about you terms and conditions for uploading a short film through you.I am Susanta from West Bengal / Kolkata. I am making a short film and I want to keep touch with Pocket films over phone (i.e. 022 28772090.) but i am not getting anybody . However can you tell me the mobile no. of the key person of pocket films.if you do its very helpful for me . thanks with regards. Susanta. How to Start Your Own Film Society in India?